It is hot here today, so I've got the windows open and the music playing...best time to get the creative juices flowing! I know Studio L3 has a challenge going on using Distress Glitter, one of my favorite products! So, I thought I would create a project today to support the challenge. Hoping that if you like what you see here, you might be inspired to make something yourself using Distress Glitter (and even enter the challenge!). 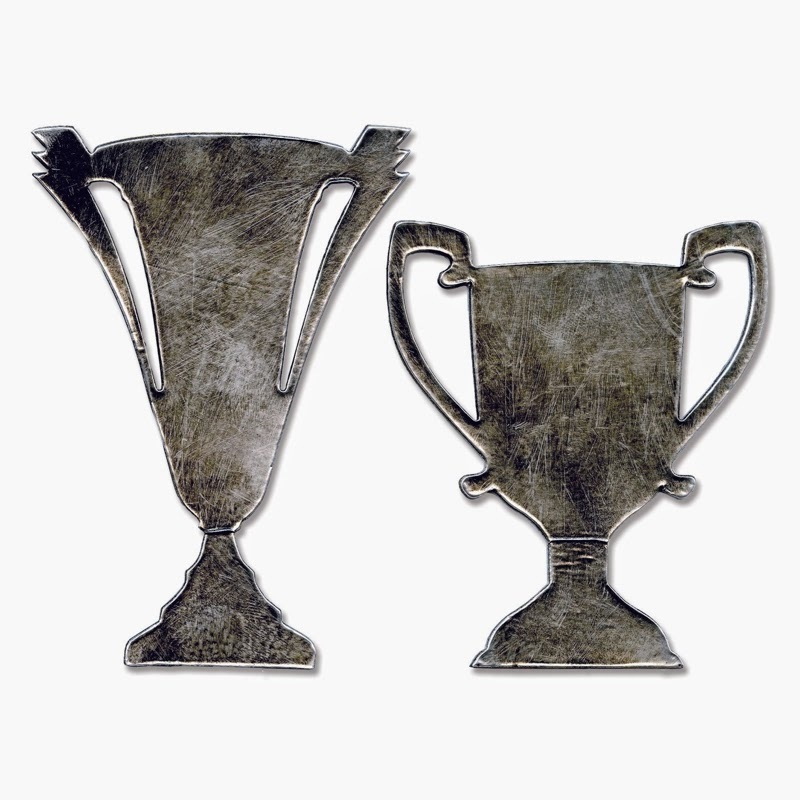 I cut a piece of chipboard using the Sizzix Alterations - Tarnished Trophies die. The die has two different trophy shapes. I am using the smaller of the two today (it is about 3 1/2" tall). Once cut, I always paint the surface the same color as the glitter I am using, as it always looks better once finished. I decided to use Pumice Stone to create a traditional trophy color. 1. Distress Glitter mimics the look of glass glitter or mica, so resist the urge to press it down into the glue...it should be a bit uneven so the light can catch the layers of glitter. 2. It is heat stable, meaning you can dry it with your heat tool and it will not melt. 3. Distress Glitter is totally inkable, so once dry, you can ink the edges just like cardstock. While the trophy is drying, I cut four, 3 x 4" pieces of Wallflower paper (these are scaled down papers at the back of the Wallflower paper stash). I used the zigzag stitch on my sewing machine to sew them together, creating a patchwork effect. Then a bit of edge distressing and ink with Gathered Twigs (you will find it in pack #6 of the Distress Ink Minis). 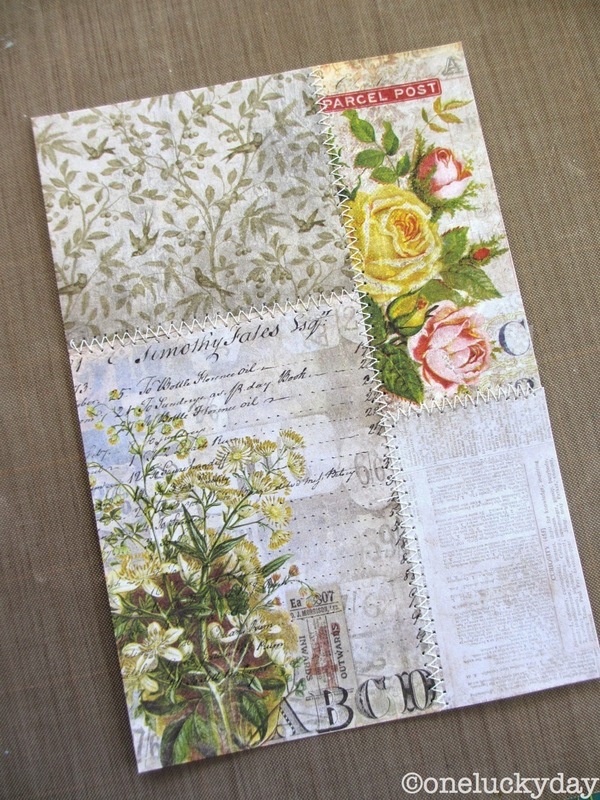 Stitch the paper patchwork to a card front (I used a gray cardstock for my card). Add the glittered trophy with thin foam tape. NOTE: this is the part where I should have showed the trophy with Distress Ink on the edges. Please note this step in the final photos. 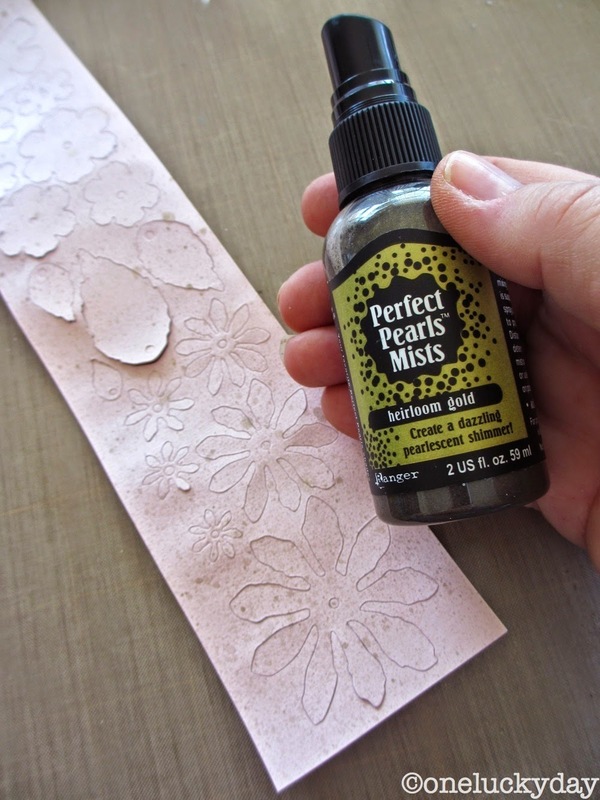 I used some light pink cardstock to cut TWO strips of the Tattered Floral Garland, then sprayed each with Perfect Pearls Mists - Heirloom Gold (remember to shake before use). then lightly inked the edges of the flowers. I made little stacks of flowers, leaving the large sizes for another day (too big for this project). I ended up making 5 medium flowers and 3 really small ones. Once I have the stacks made, I lightly sprayed each side of the flower with water and crumpled each in my hand. It does take a bit of crunching and smashing to break down the cardstock. The water helps to break the paper down as well as "puff" up the cut edges. If your flower is too damp, just dry it with the Heat it tool to stabilize it. I cut some Ranger Manila cardstock using the Tattered Curvy Banners decorative strip. I chose a small sized banner for this project and added ink and added a phrase from the Remnant Rubs sheet - Words. Just a tip here - since the words on the Remnant Rubs sheet are in a straight line, I cut the words apart. I added "with", and then "heart" on the other end. Then I went back and filled in with "all my" to get the spacing right. Okay, so time to fill the trophy with flowers. I added a bit of French lace with a hot glue gun (I was impatient), then just started adding flowers one at a time. Add the banner made previously with foam tape in only the center section. I used Peeled Paint to ink up the pink leaves. I like the way the Distress Ink saturates the cardstock and creates a good rich green color. Crinkle the leaves and add to the bouquet (gosh they kinda look real, don't they?). Love the way this turned out. The lace just peeks out in between the flowers. I know I could have added more rubs or other embellishments but part of creating is also editing. Knowing when it is enough. And this is just enough for me. The Distress Glitter does not disappoint...looks like vintage glass glitter. Just a wonderful effect. Have you heard about the Compendium of Curiosities Challenge over at Studio L3? Linda is working her way through Tim's new book, A Compendium of Curiosities III and challenging everyone to follow along. A new challenge is posted every 2 weeks and of course someone is going to win a prize at the end of each challenge. If you are interested in participating, you can read all about it here. Well, I hope you will pop over a check out the challenge. Maybe even enter to win! Gorgeous!!!! Love the look of the Distress Glitter....so vintage and your flowers are beautiful!!! Well, this is just flat-out magnificent, Paula, which is not at all surprising since everything you touch turns out wonderfully! I'm so happy you joined us!!! thanks Linda! Glad to be part of the challenge! So, so pretty. Who knew trophys could be so lovely?! I just love every little thing about this. Bravo! Who would think to put flowers in a trophy cup? Not me :-) But you did, and now I like the trophy die. What beautiful flowers, too! Thanks for the tutorial. Lovely card. Marci, I love trying to figure out what to put in the cups! This is the first time I tried flowers! I love it! Oh Paula this is completely brilliant and such a great tutorial!! Love everything about it! The stitching of the papers is such a great touch and I LOVE what you did with those new banner dies,yikes, yet more items for my every growing wishlist. This is a truly stunning make!!! thank you Astrid...thoes banners can be a little tricky to fold but once you get the hang of it, it's easy (and very forgiving). They are a nice touch on any project. Wow this is such a wonderful creation, love how you pieced your Bg with such pretty papers, your flowers look great as does the folded banner, all in all a most beautiful make. The flowers are just gorgeous...wow!! thanks Gabby! I always like that build so I never put the finished result at the top. Glad you like the card. Wow! That is just fabulous!! love your flowers! Wow, this is so beautiful!!!! Gorgeous! I love every detail from the trophy to the flowers! Such a nice surprise to see your CC3C creation. I love everything you do, Paula, and this is yet another fabulous, gorgeous piece! thanks Annette - you are too kind! A beautiful card! I love the patchwork stitching and filling the trophy with flowers. Stunning!!!! I could give you my mailing address...hint hint! lol Can't wait to get into my art room and see what transpires for this challenge. I can't wait to see what you do either Susan! Sending you some creative wishes! This card is stunning...very beautiful!! Wow, I didn't think that Tim's dies could turn something beautiful, just kidding Tim, Paula you did a wonderful job making this card that is so feminine. Thanks for sharing. Welcome back! I enjoyed your guest posts last week and also the photos of your trip. Your stitching on this project made me wonder if the wallpaper stash may be part of the new fabric release. 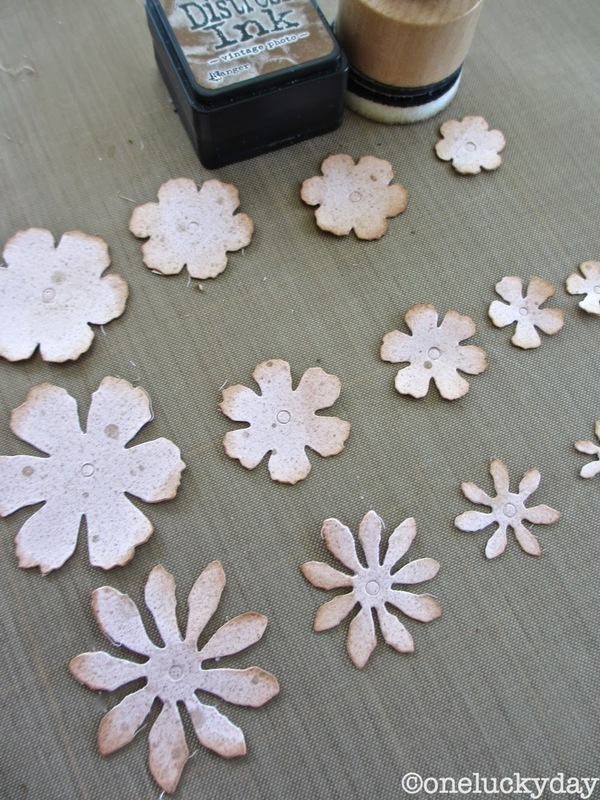 This is a terrific flower technique, your bouquet is charming and, even though I promised not to buy any more craft goodies for awhile, a little distress glitter couldn't hurt. Thanks Paula, for permission to go shopping! beautiful. Don't have any vintage glitter. After seeing this makes me have to put it on my wish list. love the finished product. This is so beautiful Paula!! Love the patterned paper background and what a great idea to fill the trophy with flowers - and such pretty flowers too! Antique Linen Distress Glitter is a favourite of mine too. Oooooooooh this is sooooooooo beautiful. I absolutely love this card here. Love, love, love this Paula! So beautifully vintage!! I love everything about it! Oh my Paula, This is so pretty! The Wall Flower Paper is truly one of my favorite media Tim has ever released in a collection. You do it justice every time you incorporate it into your work. Love that Trophy Die, too. I can think of so many ways to use it. Thanks for another wonderful Tutorial and CC3C Challenge hook-up. It is loaded with inspiration. Love everything about this beautiful creation! 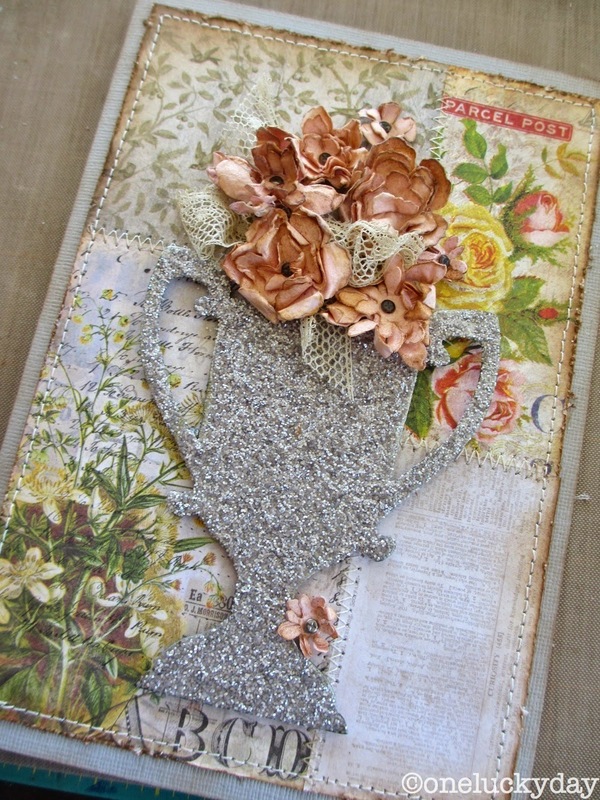 The stitched papers, the glittered trophy, the crinkled flowers, that bit of lace - just fabulous!! I love the way you did this and I would love to copy it! I like the whole vintage look , the zig zag stitching and the flowers you made. Pretty! I love how you made the flowers. Just gorgeous Paula, absolutely love it... the stitching on that wallflower paper... you gonna make me did out my sewing machine LOL !! And the flowers so real looking !! So glad Tammy T pointed me over this direction. What a beautiful card! Love seeing how it all progressed. So pretty Paula! Love the glittery trophy and beautiful blossoms! I love it… and I also love the piece in previous post! Flowers are awesome and I didn’t know that you can ink the glitters..you open so many options…thank you so much for sharing the processes with us!